Canada’s Sled Island Music Festival has just announced it’s second wave of 2017 showcasing artists, including Mike Watt & The Missingmen, DJ Quik, Guitar Wolf, Shonen Knife, MONO, Meatbodies, DIANA, Canadian proto-punk cult legends Simply Saucer, Kaitlyn Aurelia Smith, Pinkish Black, Uniform, and more. 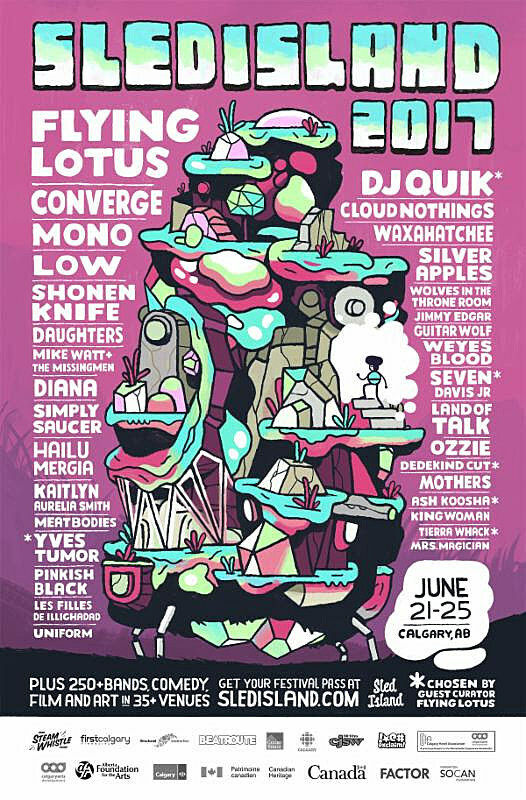 As mentioned, Flying Lotus is this year’s guest curator at Sled Island and his selections include DJ Quik, Seven Davis Jr, Yves Tumor, Dedekind Cut, Tash Koosha and Tierra Whack. All new Sled Island lineup additions are listed below. Those artists join previously announced acts Cloud Nothings, Converge, Low, Waxahatchee, Weyes Blood, Land of Talk, Mothers and more at Sled Island 2017 which happens June 21 – 25 at venues all over Calgary, Alberta. Passes and tickets are on sale now.